In 2008, the Task Group (now Commission) convened the 1st Arthur Darnley Symposium in conjunction with the 33rd International Geological Congress (IGC) in Oslo, Norway. Arthur G. Darnley (1930-2006) was the leader of IGCP Projects 259 and 360. He overseen the formation of the current Task Group on Global Geochemical Baselines, and served as its Honorary President until the end of his life. His leadership in establishing standardised protocols for conducting national and international geochemical surveys was a major contribution toward the development of a global geochemical reference database and the understanding of the chemical composition of our planet. In 2012 and 2016 the 2nd and 3rdArthur Darnley Symposium were held in conjunction with the 34th IGC in Brisbane, Australia, and 35th IGC in Cape Town, South Africa, respectively. The 4th Arthur Darnley Symposium is planned to be held in Delhi, India, on the occasion of the 36th IGC. The Task Group (now Commission) organised, during the 33rd IGC on the 9th August 2008, a one-day symposium to commemorate Arthur G. Darnley’s contributions to the field of geochemical mapping. 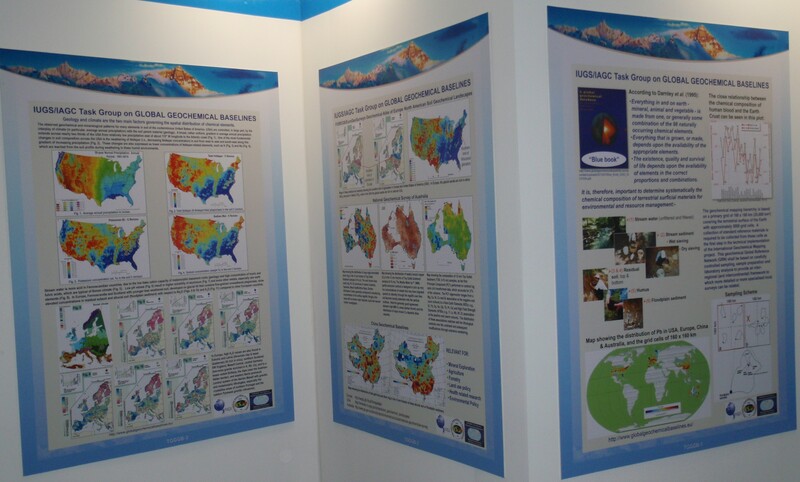 This symposium, titled “Geochemical mapping from the global to the local scale Geochemistry: Exploration, Environment, Analysis in memory of Arthur during 2008 (Volume 8, Part 3/4) that was distributed to symposium attendees. The volume contains 12 papers and was guest edited by Clemens Reimann (Geological Survey of Norway) and David B. Smith (U.S. Geological Survey). A Memorial DVD was also prepared for distribution at the IGC. This DVD contains many publications on geochemical mapping including the two-volume Geochemical Atlas of Europe and the papers published in the volume of Geochemistry: Exploration-Environment-Analysis, dedicated to Arthur Darnley. The Commission wishes to thank the following publishers for granting permission to include papers from many of their journals on this DVD: Elsevier [http://www.elsevier.com/], Geological Society of London [http://www.geolsoc.org.uk/], Springer [http://www.springer.com/], and Maney Publishing [http://www.maney.co.uk/]. Copies of the DVD can be obtained from David B. Smith [E-mail: dsmith@usgs.gov] or Alecos Demetriades [E-mail: alecos.demetriades@gmail.com]. Patrice de Caritat, Ian Lambert. The national geochemical survey of Australia: Outline and update. Gloria Prieto, Luz M. Gonzalez, Orlando Vargas, Gustavo I. Garcia. Geochemical atlas of Colombia, exploring the Colombian territory. Olufemi Ogedengbe, Tunde Arisekola, Emmanuel Ayoade, Siyan Malomo, Akinlolu Abimbola. Geochemical Baseline Project: a preliminary result from cell N06E04, southwestern Nigeria. Clemens Reimann, Reijo Salminen. Geochemistry of Europe – the importance of sample material and scale. Igor Bogatyrev, Victor Chekushin, Reijo Salminen, Kaj Lax, Sergey Glavatskikh, Clemens Reimann, Virgilia Gregorauskiene, Valter Petersell, Aivars Gilucis. Integrated Database of Northern Europe Geochemistry (NEG) Project. Reijo Salminen, Victor Chekushin, Igor Bogatyrev, Aivars Gilucis, Sergey P. Glavatskikh, Arakadi Golovin, Virgilija Gregorauskiene, Jari Mäkinen, Valter Petersell, Kaj Lax, Clemens Reimann, Lobov Selenok, Olga Tomilina. Northern Europe Geochemistry (NEG) – a metadata-base for 21 international and national regional geochemical databases. Benedetto De Vivo, Annamaria Lima, Maria Anna Bove, Giuseppe Sabatini, Pietro Frizzo. Enviromental geochemical atlas of Italy. Andrey Morozov, Eduard Burenkov, Arkadiy Golovin, Alexander Kremenetskiy, Tatyana Chepkasova. Multipurpose geochemical mapping of Russia: the technology and the results. Xueqiu Wang. Multi-scale geochemical mapping in China. Yunchuan Xiang, Rongmei Liu. Compiling methods on National Regional Geochemical Series Maps of China. Mathew Joseph, D. Rout. Geochemical mapping in the the type area for laterite, Malappuram district, Kerala, India. Sujatha Dantu. Regional geochemical baseline mapping in Medak district, Andhra Pradesh, India. Mani Pirouzbakht, Mehdi Ahadi, Bijan Esfandiari. Application of a fractal method relating concentrations and areas for separation of geochemical anomalies from background in stream sediments. David B. Smith, Martin B. Goldhaber, Andy Rencz, Juan Carlos Salinas. The North American Soil Geochemical Landscapes Project. Jorge Chiprés, Juan Carlos Salinas, Javier Castro-Larragoitia, Fernando Diaz-Barriga, Israel Razo, Sandra Gamino, Marcos Monroy. Multi-scale geochemical mapping of soils: Natural and anthropogenic patterns from the national to the local scale. Job Spijker, Grishja Van Der Veer, Gerben Mol. Spatial patterns of natural variation, anthropogenic impact, and chemical reactivity in Dutch soils. Valera Paolo, Alberto Marcello, Salvatore Pretti. Geochemical environment characterisation of Sardinia. David B. Smith, Clemens Reimann. Low-density, continental-scale geochemical mapping: Are the resulting geochemical patterns robust? Sunil Trivedi Kumar. Biogeochemical prospecting at Khetri Copper Deposit of Rajasthan, India. Olga Tomilina, Victor Chekushin, Reijo Salminen, Kaj Lax, Clemens Reimann, Virgilija Gregorauskiene, Valter Petersell, Aivars Gilucis, Natalia Guljaeva. Northern Europe Geochemistry (NEG) Project – Assessment of Environmental status. Victor Chekushin, Lubov Selenok, Igor Bogatyrev, Sergey Glavatskikh, Reijo Salminen, Kaj Lax, Clemens Reimann, Virgilia Gregorauskiene, Valter Petersell, Aivars Gilucis, Arkadiy Golovin, Lev Krinochkin. Northern Europe geochemistry (NEG) project – Map of ore related anomalous geochemical fields of fennoscandian shield and it’s eastern frame at the scale of 1: 5 000 000. Megan Lech, Patrice de Caritat. Recent results from a geochemical survey in the New South Wales part of the Thomson Orogen in Australia: Implications for mineral exploration. Reijo Salminen, Johathan Kashabano, Yokbeth Myumbilwa, Faustin Nyanda Petro, Matti Partanen. Indications of deposits of gold and platinum group elements from a regional geochemical stream sediment survey in north-western Tanzania. Stanislav Rapant, Reijo Salminen, Timo Tarvainen, Katarina Krcmova, Veronika Cveckova. Application of a risk assessment method on European wide geochemical baseline data. Vojin Gordanic, Aleksandra Ciric, Dragan Jovanovic. Geochemical investigation of radon in soil within the igneous-sedimentary complex of Southern Serbia – ecological significance. Antonio Cosenza, Stefano Albanese, Diego Civitillo, Benedetto De Vivo, Annamaria Lima, Elisa Macaione, Antonia Messina. The environmental geochemical atlas of the Natural Park of Nebrodi (Sicily, Italy). The International Association of GeoChemistry (IAGC) used the 1st Arthur Darnley Symposium as the forum for presenting two awards. The Vernadsky Medal is presented by IAGC in recognition of distinguished scientific accomplishment in geochemistry over the course of a career. It was most appropriate that the Darnley Symposium was chosen as the venue for presenting the 2008 Vernadsky Medal to Professor Bjørn Bølviken of the Geological Survey of Norway. Professor Bølviken has been a pioneer in developing methods for low-sampling density geochemical mapping among his many other accomplishments. Also at the Darnley Symposium, members of the Western European Geological Surveys Working Group on ‘Regional Geochemical Mapping’ (active from 1986 to 1993) presented Professor Bølviken with a framed document signed at their last meeting in Hannover on the 1st July 1993. The dedication was: “Bølviken’s Regional Geochemical Mapping of Western Europe towards the Year 2000: A very important project ahead of its time. Conceived by a person with extreme foresight and supported by Europeans with different cultures, proving that European unity could be realised as long as people meet and discuss matters openly and with integrity. Thank you for bringing us together and hope that we meet again to complete the ‘dream’”. The ‘dream’ was in fact completed in 2006 with the publication of the 2nd volume of the Geochemical Atlas of Europe. Therefore, with this important acknowledgement of Professor Bølviken’s contribution, a significant chapter of European geochemistry was concluded. The recognition was indeed timely, because Professor Bjørn Bølviken passed away on the 19th January 2009 at the age of 81. Bjørn Bølviken’s presentation by WEGS team members can be downloaded from here. The IUGS/IAGC Task Group (now Commission) on ‘Global Geochemical Baselines’ organised the 2nd Arthur Darnley Symposium with the title ‘Global geochemical mapping: understanding chemical Earth’ at the 34th IGC in Brisbane, Australia [http://www.34igc.org/]. The session was co-chaired by David B. Smith [dsmith@usgs.gov] (USA), Xueqiu Wang (Institute of Geophysical and Geochemical Exploration, China) and Patrice de Caritat (Geoscience Australia). The Arthur Darnley Symposium was held under Theme 4 ‘Environmental Science’ on Wednesday, 8 August 2012. Xueqiu, W Wang, Lanshi Nie, Shanfa Xu. A world geochemical map: Understanding chemical Earth. Patrice de Caritat, Michelle Cooper, Evgeniy Bastrakov, Subhash Jaireth, John Wilford. The National Geochemical Survey of Australia: o verview and results to date. Pradip K. Govil. Global geochemical baseline mapping for environmental management using top soil in India: An overview. David Cohen, Neil Rutherford, Shawn Laffan, Andreas Zissimos, Eleni Morisseau. The soil geochemical atlas of Cyprus—Advantages of a high density regional survey. Atsuyuki Ohta, Noboru Imai. A nationwide marine geochemical mapping project in Japan. Arkadiy Golovin, Natalya Gulyaeva, Olgo Kal’eva, Boris Kolotov. Assessment of environment pollution with toxic chemical elements, using multipurpose geochemical mapping (MPGM). Clemens Reimann, Manfred Birke, Alecos Demetriades, Christopher C. Johnson, GEMAS Project Team. Geochemical atlas of European agricultural and grazing land soil. David B. Smith, William F. Cannon, Laurel G. Woodruff. Mapping the geochemistry and mineralogy of soils of the conterminous United States. P.K. Mukherjee, K.K. Purohit, P.P. Khanna, N.K. Saini. Arc magmatic provenance for Lesser Himalayan sedimentary sequence (LHSS): t race elemental evidence from low-order stream sediment geochemistry and regional geochemical mapping. Guo-Li Yuan, Xiao-Chao Che, Gen-Hou Wang. Cold-trapping of POPs in central Tibetan Plateau, China: influences of soil components. Limin Ren, David Cohen, John Triantafilis, Neil Rutherford, Andreas Zissimos, Eleni Morisseau. The soil geochemical atlas of Cyprus—controls on rare earth element patterns. Andreas Zissimos, Eleni Morisseau, Eleni Stavrou, David Cohen, Neil Rutherford. The soil geochemical atlas of Cyprus—distribution of total and organic carbon. Clemens Reimann, Patrice de Caritat, GEMAS Project Team, NGSA Project Team. Comparison of two continental-scale geochemical surveys: what lessons for global geochemical mapping can we learn? Alethea E.M. Sallun, David B. Smith, Bruna C. Xavier, Cristiane L.F.A. Roberto, Alessandro Cesarino. Establishment of natural geochemical background values in the State of São Paulo, Brazil. Mauro Cesar Geraldes. Using plasma spectrochemistry for the analysis of hazardous substances in the marine environment: the Sepetiba Bay, Rio de Janeiro (Brazil). Qingye Hou, Zhongfang Yang, Tao Yu. Quantifying heavy metal inputs to agricultural soil in Peking, China. Jaana Jarva, Timo Tarvainen. The use of soil geochemical baselines in land use planning in Finland. Christopher C. Johnson, G-BASE Project Team. Mapping the chemical environment of London, UK — an important contribution to understanding national levels of normal background contaminant concentrations. Clemens Reimann, Manfred Birke, Alecos Demetriades, Christopher C. Johnson, EGG Project Team. Geochemical atlas of European ground water: bottled water. Christopher C. Johnson, Nigeria Geochemical Mapping Project Team. Regional geochemical mapping in Nigeria: results from the collaborative project between the Nigerian Geological Survey Agency and the British Geological Survey. Lev Krinochkin, Arkadiy Golovin, Grigoriy Gusev, Viktor Kilipko. Geochemical map of Russia scale 1:2,500,000. W.F. Cannon, David B. Smith, Federico Solano, Tiffani Westphal, John Jackson. Maps of the mineral content of soils of the conterminous United States. Laurel G. Woodruff, David B. Smith, William F. Cannon. Continental-scale soil geochemistry from the North American Soil Geochemical Landscapes Project. Katherine Stoate, Steve Hill, Karin Barovich. In between fresh rock and fresh air: landscape geochemistry of Kangaroo Island. Mariangela Garcia Praca Leite, Raphael Vicq, Fellipe Pinheiro Chagas. Geochemistry mapping: purpose of stream sediments sampling in two tropical basins, Brazil. Malte Willmes, Ceridwen Boel, Rainer Grün, Richard Armstrong, Antoine Chancerel, Bruno Maureille, Patrice Courtaud. The bioavailable Sr isotope reference database of France — a tool for archaeology and forensic sciences. Weihai Xu, Xiangdong Li, Wen Yan, Li Miao. Trace metals in atmospheric particular matters over the northern South China Sea (SCS): regional sources and long-range atmospheric transport. Xiaohuan Xi, Min Li, Zhongfang Yang. An introduction: the multi-purpose regional geochemical survey and evaluation in China. Shuang Zhang, Dong Yang, Fanglin Li, Bin Huang, Zhengyu Bao, Dongfeng Zou, Decun Zhang. The prediction of soil geochemical baseline with partition and multiple regression analysis: a case study in Jianghan Plain, China. The IUGS/IAGC Task Group (now Commission) on ‘Global Geochemical Baselines’ organised the 3rd Arthur Darnley Symposium with the title ‘Mapping the geochemistry of the Earth’s surface at global to local scales’ at the 35th IGC in Cape Town, South Africa [http://www.35igc.org/]. The session was co-chaired by Xueqiu Wang (Executive Director of UNESCO International Centre on Global-Scale Geochemistry and 2nd Co-chair of Commission) and Alecos Demetriades (Commission Treasurer and Chair of Sampling Committee). The Arthur Darnley Symposium was held under the session of Geoscience for Society, Theme 3 ‘Public Sector Geoscience and Geological Surveys’ on Tuesday, 30 August 2016, and was attended by more than fifty people. A list of oral and poster presentations is given below. Demetriades, A., Smith, D.B., Wang, X. & Caritat, P. de, 2016. Mapping the geochemistry of the Earth’s surface at global to local scales (Keynote presentation). Wang, X., Nie, L., Yao, W.S. & Zhou, J., 2016. Mapping the Chemical Earth: sustaining natural resources and environments. Wensheng, Y., Qin, Z. & Wang, X., 2016. Comparability and traceability in laboratory analysis of Global Geochemical Baselines mapping samples. Demetriades, A., Reimann, C., Birke, M. & Tarvainen, T., 2016. The three geochemical atlases of Europe. Négrel, P., Ladenberger, A., Reimann, C., Birke, M., Sadeghi, M. & the GEMAS Project Team, 2016. Ge-Ga-Cs in agricultural and grazing land soils at European continental scale. Wang, X., Nie, L. & Zhang, B., 2016. Geochemical mapping project across the boundary area of China and Mongolia. Rattenbury, M., Christie, T., Martin, A., Cohen, D., Turnbull, R., Hoogewerff, J., Baisden, T. & Rogers, K., 2016. The geochemical baseline survey of southern New Zealand. Bensid, M.L., Strauss, S.W. & Billay, A.Y., 2016. Geochemical mapping of the Tugela terrane, Kwazulu-Natal, South Africa: Semi-regional soil survey. Hou, Q., Yang, Z., Gu, Z. & Yu, T., 2016. Effect of soil erosion on soil organic carbon in Wuyuer river basin, China. Kilipko, V., 2016. Methods and Results of Regional Geochemical Prospecting of petroliferous Deposits. Kilipko, V., 2016. Geochemical Map of Russia in Scale 1:2 500 000.